I wake up somewhat groggily after a night being woken up repeatedly by the relentless chanting of the monks at a nearby monastery. Following breakfast and checking email in the hotel lobby, another late morning start, although nowhere nearly as late as normal. But then who could fault anyone from wanting to spend excessive time in the well-air conditioned rooms, particularly given the lengthy trek to the attractions that lie ahead. I do have a more serious agenda in mind for the day though … A power coffee at the Parisian cafe, some deep fried falafel and spring rolls for a relative pittance across the street, and then a trek through the leafy side streets to the east, provoking the usual curious and warm looks from locals. I pass under one railway line, along a rise looking out over a sea of rotting garbage and atmospherically poised shacks stitched together from a wild composition of materials, over another embankment along which another rail line runs, and then down into a diametrically opposite experience. Large, modern multi-leveled villas reflecting an integrity of design and fine taste, set on expansive terrains, the financing of which would make the heads of the mere mortals literally living on the other side of the tracks spin. 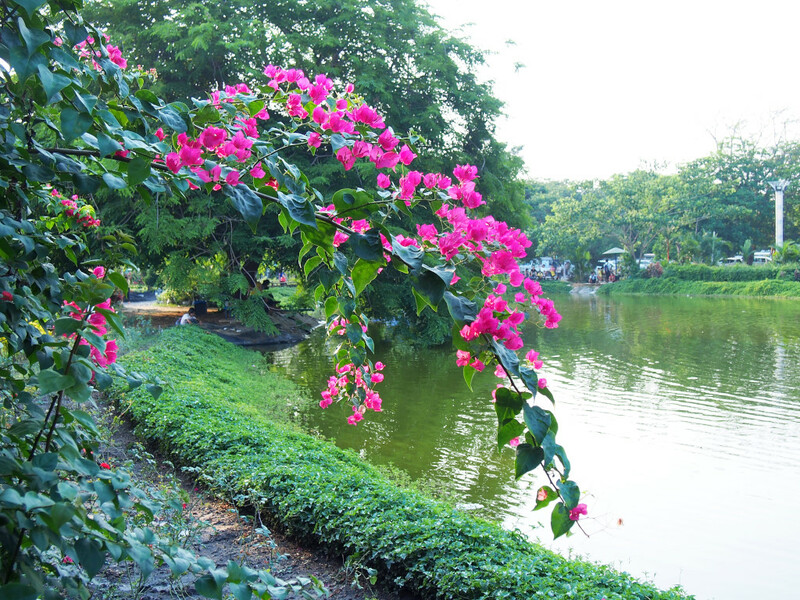 Further along, I pass the meticulously tended gardens of the modernist national parliament, the Peoples’ Park on the far side of the street offering views of the golden She Dagon paya in the distance. The heat is almost unbearable, the few locals that pass by looking somewhat uncomfortable, although not even remotely approaching my own drenched and bedraggled appearance. Stages are being erected in anticipation of the Thingyan water festival next week, but all I can think of is getting into any kind of air conditioned space. On the next block, a regal-looking villa houses an exclusive restaurant with French pretensions, the high-teens dollar price of appetizers and main dishes ranging from $40 to $50 somewhat incomprehensible to Burmese, although the impressive descriptions of the dishes on the menus don’t do much to assuage my doubts as to the caliber of the food. Why would any chef of such a high caliber bother being here, and then how could you justify such prices in a country as poor as Myanmar? But the entire developing world is the same, rich in the classes well endowed by the public purse, self-indulgent international aid executives and the upper echelons of the controlling military always ready to lavish themselves with generous rewards for their parasitic social positions. Conveniently, the embassies of brethren states are located on adjacent properties, their luxuriousness demonstrating an immunity to the prevarications that mere mortals otherwise face in such countries. 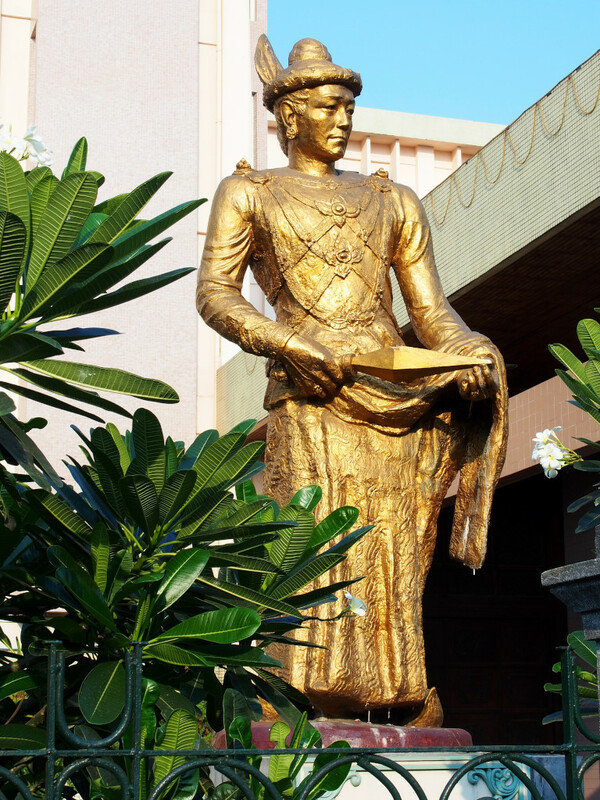 A number of oversized golden figures of early royal leaders line the front of the expansive colonial-era National Museum, and inside, the hoped-for air conditioning is barely in evidence, although at least it is nowhere nearly as hot inside as out. 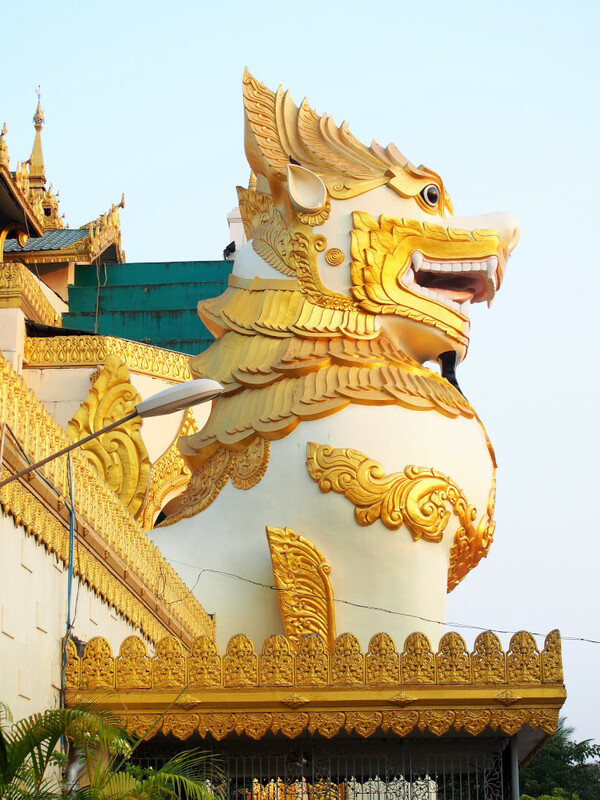 The main floor of the museum is dedicated to the artifacts of past royal cultures of Dago (the origin of Yangon) and Mandalay, including palace architecture designs and models, costumes, daises, and relevant artifacts. An entire life-size throne of the Dago court is presented, with an accompanying explanation as to what every individual gilt component of the massive structure may mean. In the end, the pomposity of the designs does little to mask their highly uniform and essentially unimaginative nature, every artifact seeming to follow a strictly prescribed aesthetic regimen. Given their apparent wear, most of the fabrics displayed are originals from past centuries. An entire column of elaborately hewed and gilt spittoons are displayed behind glass vitrines, and upstairs, the illumination of the extensive arts and craft displays is even poorer, although the quality and range of material is evident in the elaborate lacquerware, wood carvings, and the wide range of marionettes. An astonishing assortment of musical instruments is also included, large lutes, gongs and xylophones set in ornately moulded gold casings, some in the form of animals, as well as drums large and small, and the elaborately crafted shells for the miniature traditional orchestras. Not surprisingly, time runs out by the time I get through the better part of the display of arts and crafts. Apparently there are two more floors, one containing paintings and another with ethnographic information pertaining to the Burmese tribal peoples, which would definitely interest me. However, I am not feeling particularly focused at the moment, due to the intense heat and dehydration, hence cannot really foretell whether I will be coming back or not. I am not quite sure why the Lonely Planet travel guide sells the museum short, since it really presents a lot of material in the expansive building. The presentation may be a bit weak, in that relatively mediocre supporting information is provided for the material presented, with virtually no underlying conceptual information, the lighting is poor, and there is virtually no air conditioning. While the physical placement of the exhibits does not necessarily reflect a tremendous amount of imagination, the size and quality of exhibits is unquestionable, particularly pertaining to musical instruments and arts and crafts. 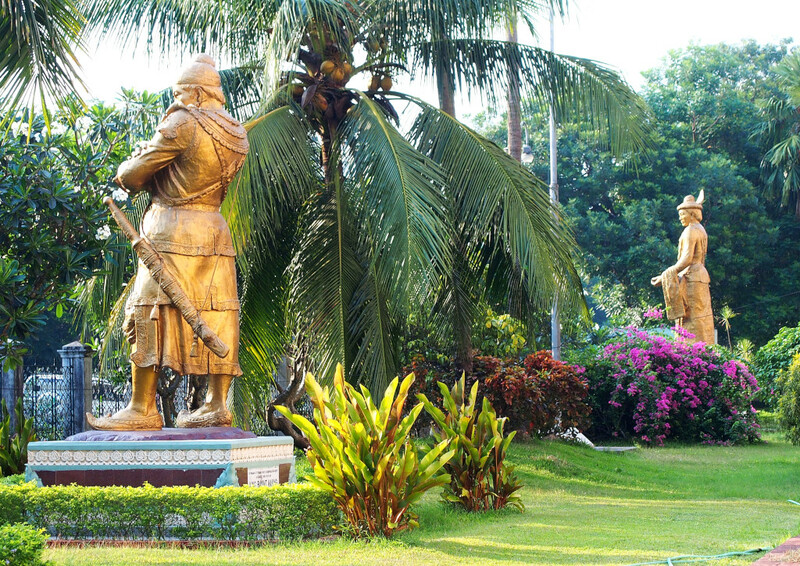 The Peoples’ Park flanking the western access to the Shwe Dagon paya is one of the town’s most expansive green spaces, the flat and open central square ideal for military parades, no doubt high on the ruling junta’s mind when the space was incepted. 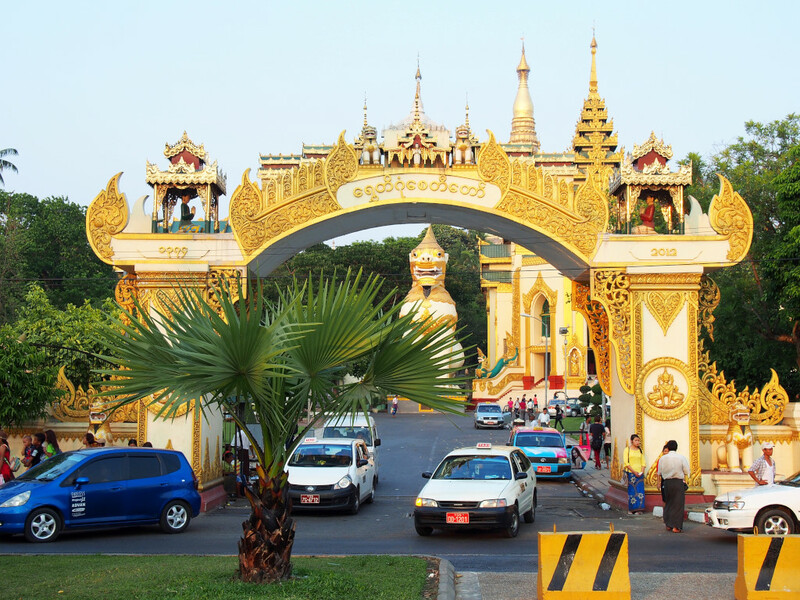 A 300 kyat entry fee is required, which seems somewhat silly, considering I only want to transit to the pagoda, although the park itself is rich in modest attractions, a round fountain comprised of disks riding on the backs of a ring of outward-facing elephants, and to the west, a lake that extends toward Pyay Road, lined with pretty flowering shrubs and whimsical sculptures. 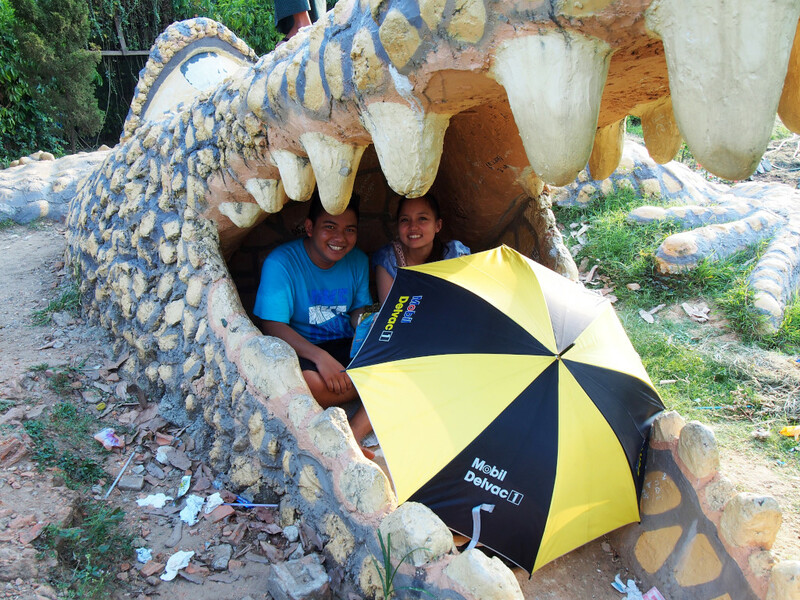 While some of the park visitors include adults with children, the vast majority of visitors are young couples seeking privacy for their romantic entanglements, often augmented with umbrellas to hide their cavorting, the omnipresent golden spire of Shwe Dagon shimmering to the east. Some diversions are available on the lake, including the large inflated round balls that guests can spin inside of on the water, a lithe young man unraveling from his own excursion onto the water as we arrive. I find it difficult to resist taking photos of some of the cute couples I pass by, who happily don’t mind being caught on film, given that I am also seen as an exotic creature in these parts. Families buy bread from vendors near the bridge, throwing copious amounts to the writhing fish in the water. Hipsters with wildly coloured hair lounge around one of the few buildings located in the park, a handful trying their luck at skateboarding with mixed success. 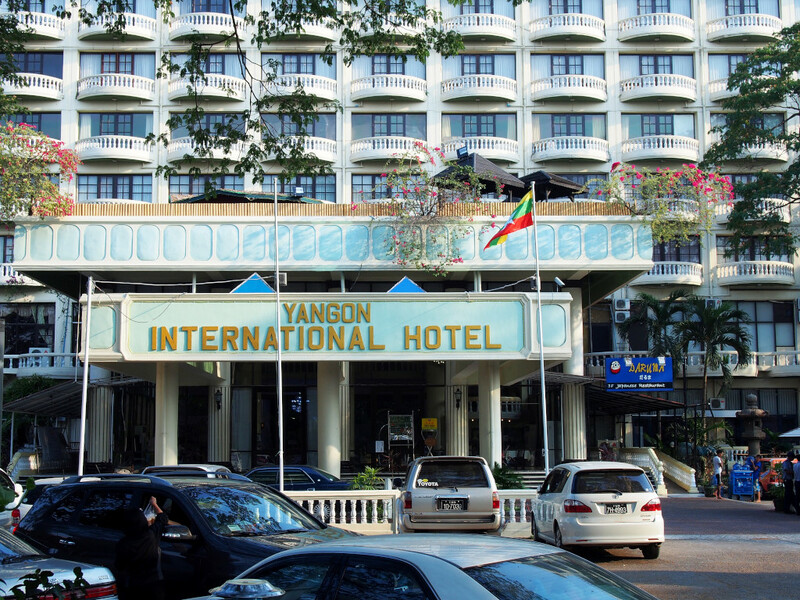 The jewel of Yangon awaits, although the afternoon light is too far gone to justify the steep entry fee. As the Peoples’ Park is inconveniently closed at the western entrance, it is necessary to clamber through some brush into the neighboring mall I conduited through the other evening, but on a different walking trajectory, the entrance to the pagoda complex across from the parking lot. 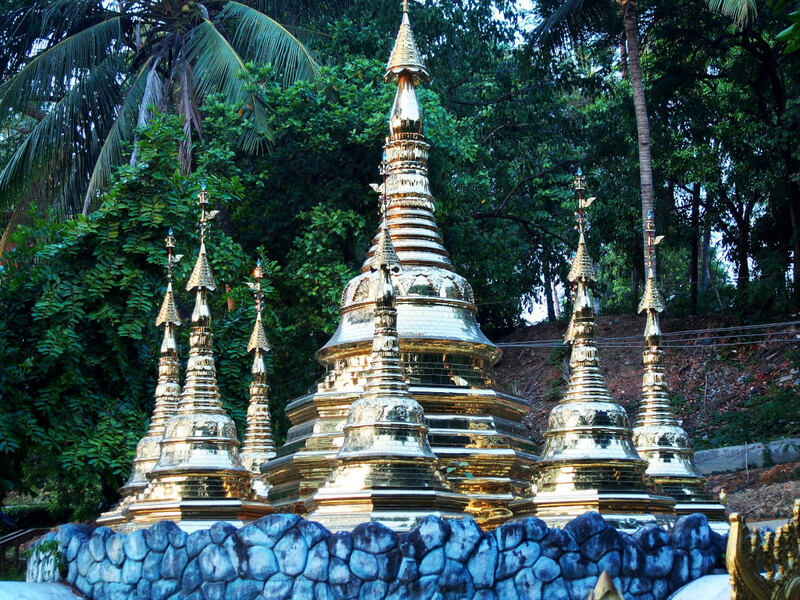 An arch rife with golden symbolism greets the visitors, who progress through the manicured gardens towards the stepped passage that climbs up to the pagoda’s summit, giant stone cream and gold guardian lions seated at the entrance, tall, fluted towers with the characteristic Burmese tiered gables looming over the entrance. Thick foliage shades the parkland surrounding Shwe Dagon, a respite for lovers seeking privacy although largely devoid of activity, another prized sanctuary in this growing city, although I don’t recall this splendidly tended green space when I visited 20 years before. 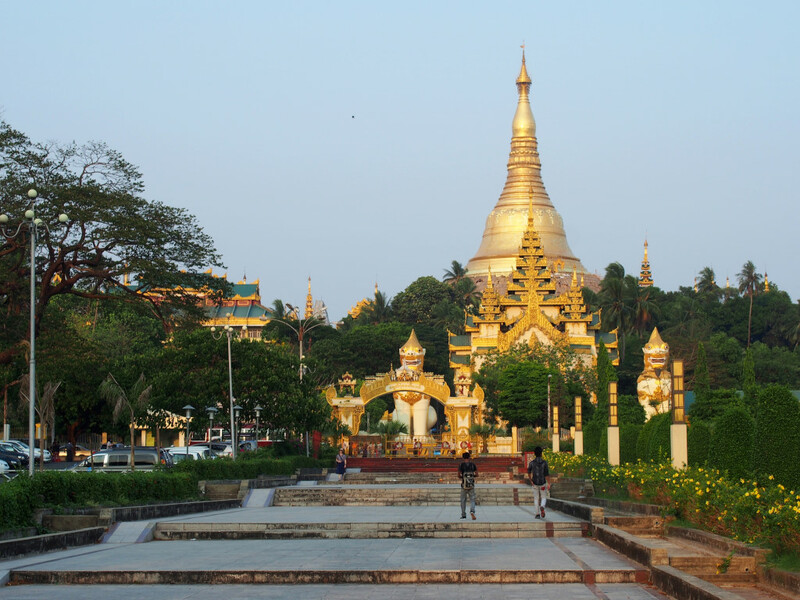 The road running around the complex brings the visitor to the terraced pavilions that channel their way from each of four cardinal points of the country’s most prized religious structure. At the northern entrance, ambulatory vendors offer a rainbow of floral offerings, assembling garlands from a raw palette of blooming flowers. 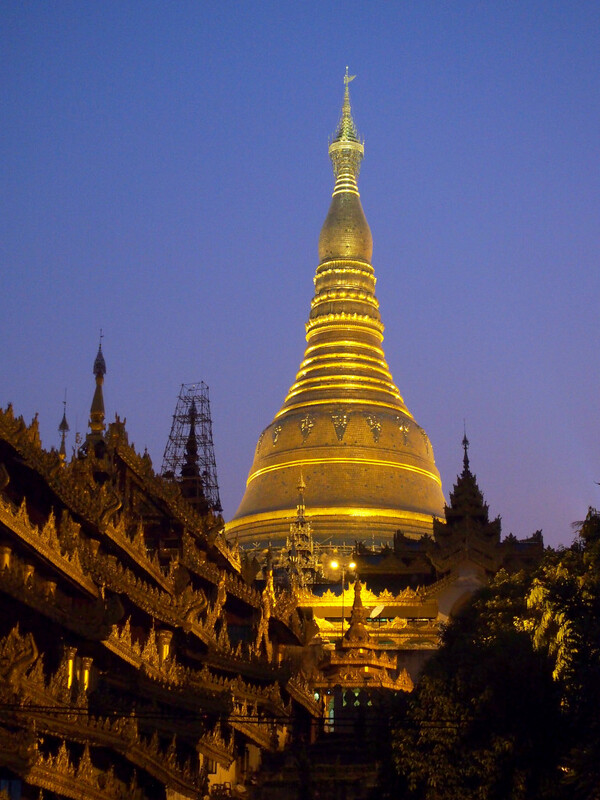 As the night encroaches on the city, the deep burnished gold of the elaborately sculpted bargeboards heralding the eastern entrance to Shwe Dagon’s shimmering spire emerge from the darkness. They tunnel their way downwards to the pedestrian enclave lined with elegant monasteries shrouded in darkness, with eateries, horrifically disfigured beggars intoning their plight, supplicants intent on their own succor roaming the maze of snacks and devotional offerings for sale, leading toward the northern entrance of the Zoological gardens. 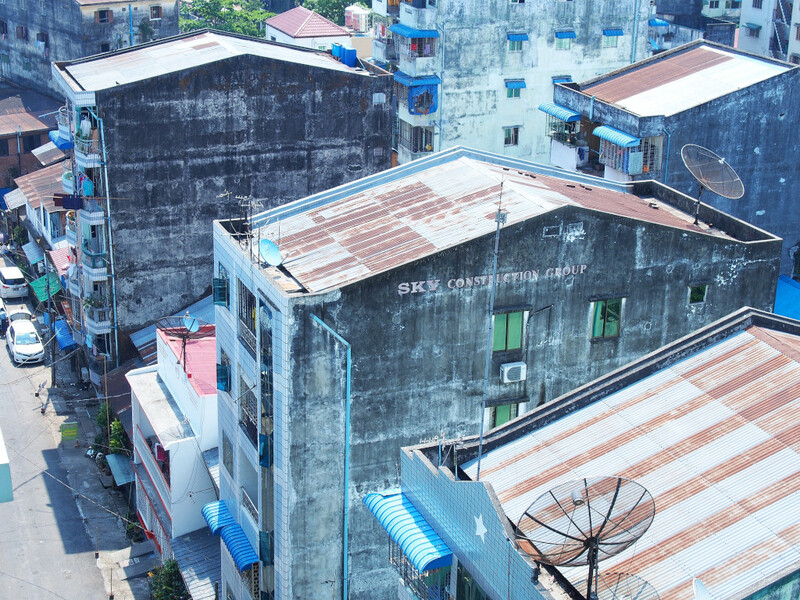 There is no point in retracing the lengthy journey on foot from the stillness of nocturnal residential Yangon back to the bright lights of the centre, although changing buses and weaving westward through the throngs of people towards Strand Road and north again, the hoped-for market north of the Great Treasure hotel amounts to nothing more than the city’s wholesale banana market. The side road descending along the river is lined with countless vendors whose small shops heave with the heavy green stalks laden with unripe bananas as far as the eye can see, with a token inclusion of coconuts and sugar cane. 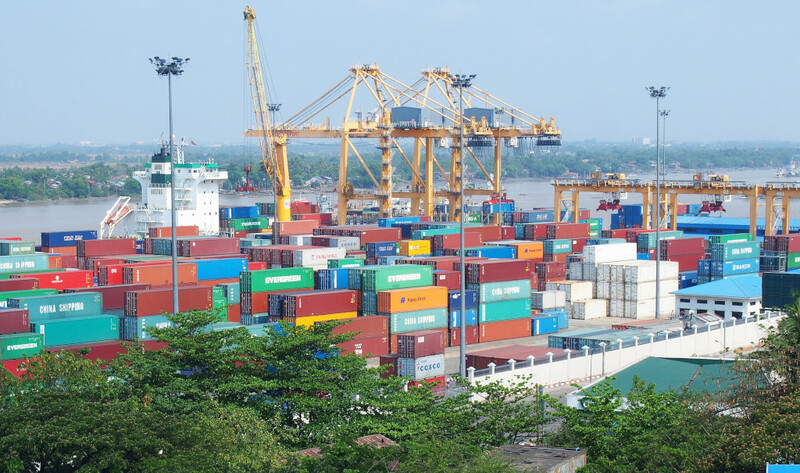 The heavily tattooed and muscular figures expertly trim the stalks with their machetes, heaving their merchandise on and off the waiting trucks, the bananas lined onto the shop floors in precision formation. 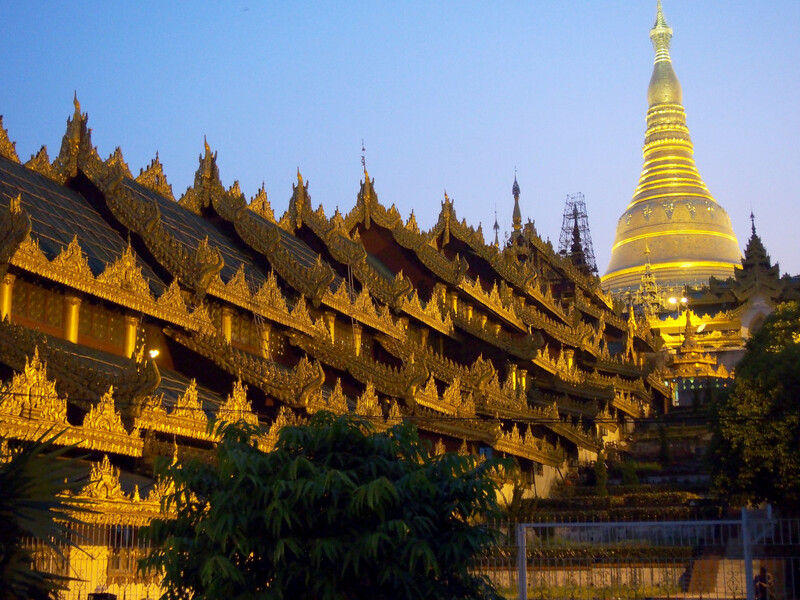 But there are no eateries to speak of, except one modest affair offering simple but tasty Burmese fare. Inexplicably, the small shops stacked high with watermelons insist on relatively high prices for their wares, even though their stores are flooded with the fruit, and no customers ever seem present to buy it.